At Dart Innovations we are not limited to particular platforms where we work with more number of Ecommerce frameworks. These are some other popular Ecommerce platforms we have in-depth knowledge with. The list below may be minimal where we work with even more. We are passionate to learn new things and challenge any requirements. When you feel none of the Open Source or hosted platform suits to your need go with our custom development solutions. We are very strong with core PHP and core .net hence any requirement on web can be achieved with our custom tailor-made solutions. VirtueMart (formerly known as mambo-phpShop) is an open source e-commerce solution designed as an extension of the Mambo or Joomla! content management systems (CMS). As an outstanding CMS Joomla powers to expand its ecommerce capability using VirtueMart extension. For an existing Joomla site owner this is a preferred solution as they can just integrate within their CMS platform and just start selling their products. It has all powerful features that needs for an ecommerce store. VirtueMart is a highly configurable and customizable multi-language shopping cart solution for Joomla 2.5 and 3 with a large number of additional extensions. As Joomla is SEO friendly VirtueMart is same. JigoShop is a WordPress eCommerce Plugin that combines broad functionality, easy migration options and professional support packages. The recent Jigoshop versions are optimised for PHP 7, search engines and PCI DSS compliant. Jigoshop eCommerce has now a core-integrated RESTful API, which makes the whole software accessible for exterior applications. JigoShop has most built-in functions such as catalog displays, order management, payment, shipping and all that an ecommerce site needs. And more it can be extended much using the add-on extensions. As it is WordPress it is always SEO friendly, highly customizable and free to use. Drupal Commerce is open-source eCommerce software that augments the content management system Drupal. Like Drupal itself, Drupal Commerce can be extended through the use of modules that add functionality and themes that define visual presentation. Drupal Commerce is preferrable for the Drupal site owners as it is easy to integrate with their existing Drupal site. It has most ecommerce functions such as product displays, order management, payment, Tax, Product discounts and more. Drupal Commerce is highly extensible, and can adapt to meet the changing needs of websites of any size through integrations with third-party systems, feature enhancements, and International functionality. As it is a Drupal module support is good, regular updates and security are sure. One of the newer ecommerce platforms, Spree is based on Ruby on Rails. Its modular platform and small learning curve make it very easy to configure and upgrade its functionality. Many of the extensions that you might want are built-in by Spree itself, instead of independent developers, which is particularly advantageous when you need timely upgrades. Perhaps the biggest advantages of Spree Commerce are its flexibility and scalability. No matter the size and complexity of your storefront, you’ll be able to customize it to your liking. That’s why it’s widely considered one of the fastest growing open source ecommerce solutions. We also work with other ecommerce platforms such as X Cart, Zencommerce, SimpleCart, WP eCommerce, Ubercart, TomatoCart, Zeuscart etc. Even if none suits to your selling concept then our custom solution is for you. 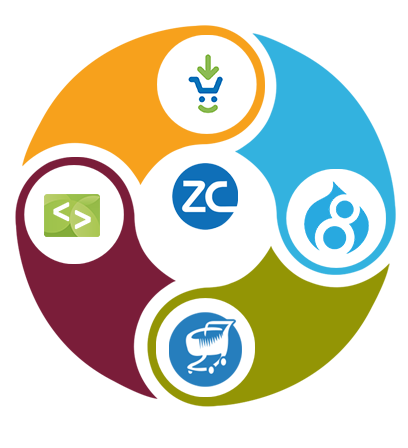 We can develop a specific ecommerce solution from Core PHP or ASP.net as per your preference. Why DART for your Ecommerce requirements. It may be confusion to start with an Ecommerce solution. If so, leave that part to us. We will collect your requirements and choose a best one based on your budgets and other needs.